We offer an Excel spreadsheet that will help you visualize how voltage standing waves are created. It's located in our download area. Update August 2018: thanks to "DIV" we fixed a problem with the standing wave spreadsheet, it is now "Rev 4". Please disregard earlier versions. 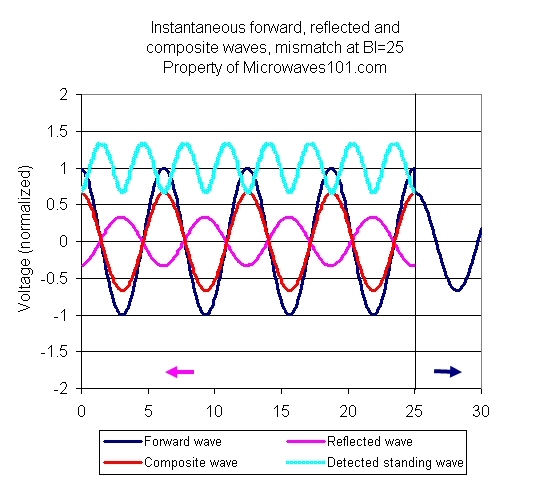 The main problem was mising coefficients on the reflected wave, it cannot have a greater amplitude than the incident wave. We added some other features include power transmitted and los calculations, ans rewrote the "readme" page so that it is easier to understand. The two charts below are snapshots in time. On the first chart, the composite wave to the left of the interface (forward plus reflected, color red) has peaks around 2, 8, 14 and 20. These are the maxima along the standing wave (and later there are other maximum between these points at 5, 11 and 17). 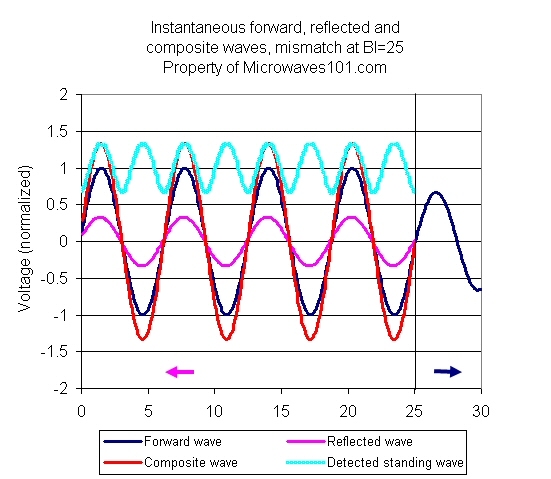 You'll also not that the composite waveform on the left does NOT have to be contiguous with the transmitted waveform on the right of the mismatch (dark blue line). The electric field is a function of the line impedance. If the impedance steps up, say from 50 ohms to 100 ohms, peak voltage increases at the interface, but power decreases, as power is V^2/R. The "missing" power is reflected back to the source. Still working on re-writing this, come back soon! These images are nothing compared to seeing the waveform move before your eyes, with your mouse controlling the speed. Go get the download called Standingwave101-Rev4.xlsm!